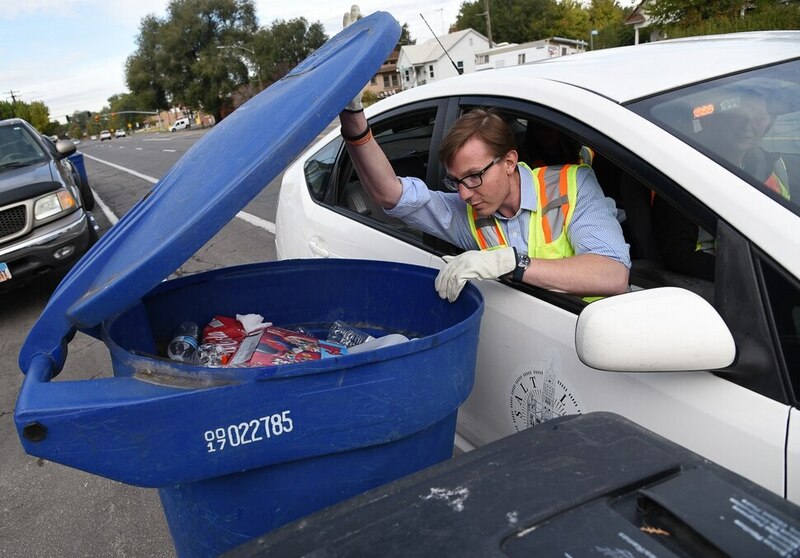 (Francisco Kjolseth | The Salt Lake Tribune) David Johnston, permits coordinator for Salt Lake City Corporation Sanitation Division checks on people's recycling bins in an effort to reduce waste problems in the recycling stream. One of the primary changes in the last year is the recycling program no longer takes styrofoam or plastic bags, including plastic bags that might be used to hold peoples recyclables. (Francisco Kjolseth | The Salt Lake Tribune) Flyers illustrate the items that can be recycled by Salt Lake City Corporation, although in the past year plastic bags and styrofoam are no longer accepted. (Francisco Kjolseth | The Salt Lake Tribune) Jen Farrell, lead outreach and education specialist for Salt Lake City Corporation Sanitation Division and permits coordinator David Johnston remove office flooring plastic that cannot be recycled. The recycling education team issue an average of 150 tags per week as they educate the public on what can be recycled. (Francisco Kjolseth | The Salt Lake Tribune) Jen Farrell, lead outreach and education specialist for Salt Lake City Corporation Sanitation Division places a notice on a recycle bin for the recycle truck not to collect that week after finding a large tent like canvas with rope buried deep inside the bin. Salt Lake City employees go around the city and look into people's recycling bins in an effort to educate the public on what can and can't be recycled to reduce problems in the recycling stream (Francisco Kjolseth | The Salt Lake Tribune) Jen Farrell, lead outreach and education specialist for Salt Lake City Corporation Sanitation Division and permits coordinator David Johnston check on bins and leave a recycling guide after finding items that can't be recycled. 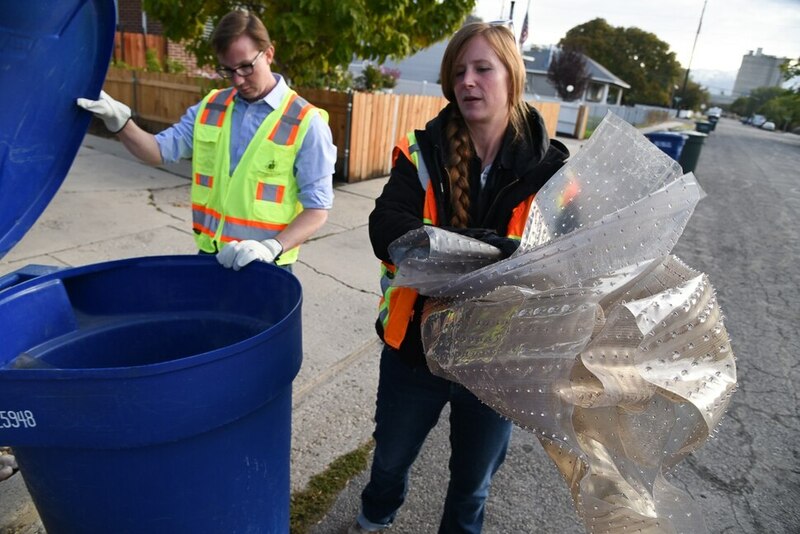 (Francisco Kjolseth | The Salt Lake Tribune) Salt Lake City employees go around the city and look into people's recycling bins in an effort to reduce waste problems in the recycling stream. One of the primary changes is plastic bags are no longer taken, even plastic bags that people might use to hold their recyclables as they carry their items to the bin. (Francisco Kjolseth | The Salt Lake Tribune) David Johnston, permits coordinator for Salt Lake City Corporation Sanitation Division checks on people's recycling bins in an effort to reduce waste problems in the recycling stream. One of the primary changes in the last year is the recycling program no longer takes styrofoam or plastic films and bags, including plastic bags that might be used to hold peoples recyclables. 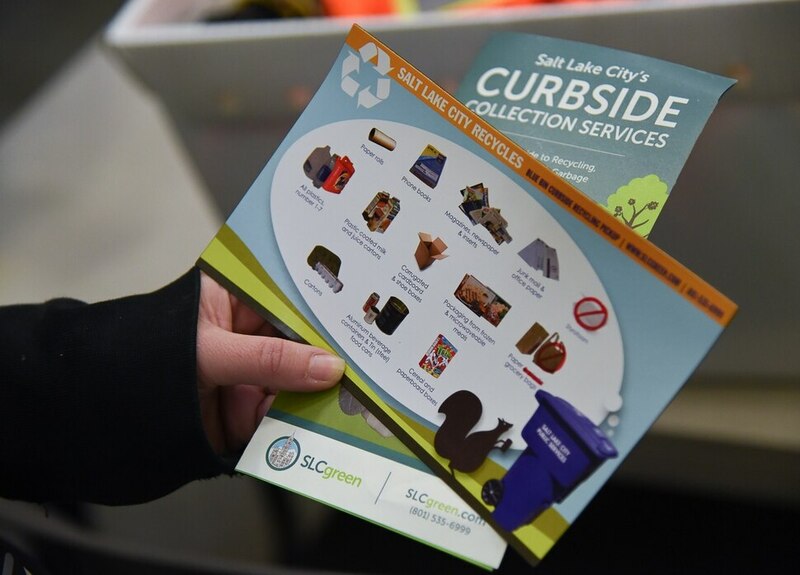 (Francisco Kjolseth | The Salt Lake Tribune) Jen Farrell, lead outreach and education specialist for Salt Lake City Corporation Sanitation Division points out the different regions around the city that they service for recycling. (Francisco Kjolseth | The Salt Lake Tribune) David Johnston, permits coordinator for Salt Lake City Corporation Sanitation Division checks on people's recycling bins in an effort to reduce waste problems in the recycling stream. One of the primary changes in the last year is the recycling program no longer takes styrofoam or plastic bags, including plastic bags that might be used to hold peoples recyclables. On a recent Thursday morning, Jennifer Farrell opens the lid of a blue recycling bin in Salt Lake City’s Poplar Grove neighborhood and pokes her head in. It’s heavy — filled to the brim with some recyclables but also with tarp and vinyl. Farrell, the waste and education and outreach lead with Salt Lake City’s Waste and Recycling Division, oversees a team of five employees who deploy every weekday morning half an hour before the recycling trucks go out to dig through residents’ blue cans in an effort to keep trash out of the city’s recycling stream. The program has been around for a few years, but it has become especially important in the face of changing economic conditions in China, which takes much of the world’s recycling exports and has begun cracking down on high contamination rates. Salt Lake City’s waste stream is cleaner than many cities its size, but 20 percent of the items residents put in their blue bins still end up in the landfill, Farrell said. That means the city not only is paying to recycle goods but is also being charged a daily fee for nonrecyclable contamination. And this area — west of 200 East — is one of the city’s worst. Of the nearly 20 cans Farrell and associate David Johnston checked as they spoke to The Salt Lake Tribune, only one had enough waste that it needed to be tagged and stapled closed. But the two found nonrecyclables in almost every can they checked and left flyers on most to educate people about what should and shouldn’t go into their cans. At some points, they even moved waste themselves from a blue bin into the garbage. The city doesn’t have enough resources to check every can, so the so-called Recycling Education Team works to target areas that have historically had higher contamination rates. The team tags about 150 cans a week out of the more than the 40,000 they’re able to inspect. They use their other senses as well, she noted, shaking the recycling bin to hear if there’s glass in the bottom and even smelling inside the can to determine if there’s something in there that shouldn’t be. When residents' recycling streams are too contaminated, the education team will tag the bin, staple it closed and follow up with residents later to make sure they understand why their recycling couldn’t be taken. And in the six years the program has been active, Farrell said she’s seen improvement in the recycling stream. “There’s a lot less waste than there was before,” she said. Rebecca Smith, the sustainability director at ACE Recycling & Disposal, said Salt Lake City is the only municipality she knows of in the state that is auditing its residents’ recycling cans — but it certainly isn’t the only one that’s facing garbage in the stream. ACE, which partners with 13 cities for recycling and garbage hauling, recently spent six weeks helping West Valley City check its recycling bins after taking over the city’s contract. The teams found at least some level of contamination in almost every can, she said. Some people are making minor mistakes, she said, but the recycling facility has seen some “bizarre things,” including an entire toilet, dead animals, a metal sword and a 3-foot-tall plastic toy. Auditing cans is one of the best ways to keep a recycling stream clean, she said, but it’s a lot of work, and most cities haven’t prioritized the funding — particularly now that it costs many cities across the Wasatch Front more money to recycle than it does to entomb items in landfills following international recycling changes. The West Valley City Council recently increased its recycling fees for residents in an effort to lessen that economic impact, and it will also now allow residents to opt out of the service. Sam Johnson, a spokesman for the city, said the program is too new to know how many residents will stop recycling but pointed out that the program change is part of efforts to reduce contamination. In Salt Lake City, Farrell said they’re nowhere close to charging residents for recycling, recognizing the service as an important part of the city’s wider sustainability goals. While recycling has plenty of benefits, Farrell said it shouldn’t be thought of as the end of individual sustainability efforts.